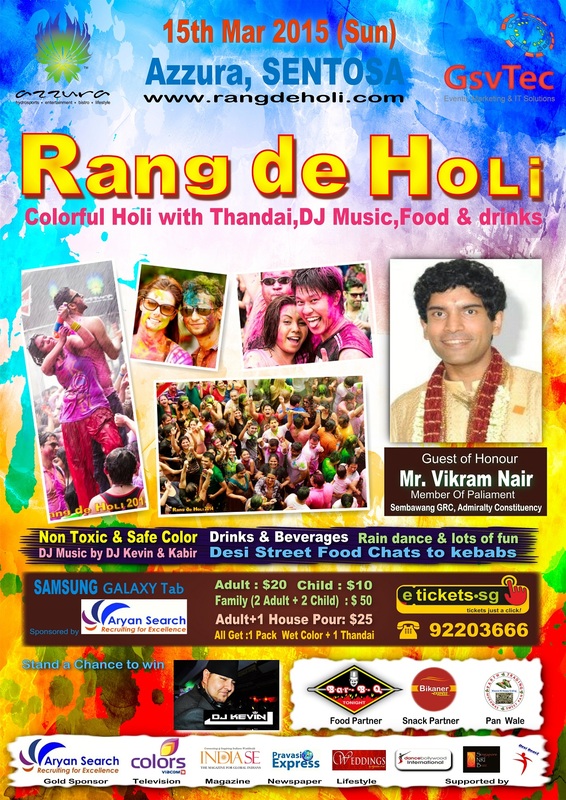 We welcome you to join us for an Day full of fun and celebrate the festival of colours with us. 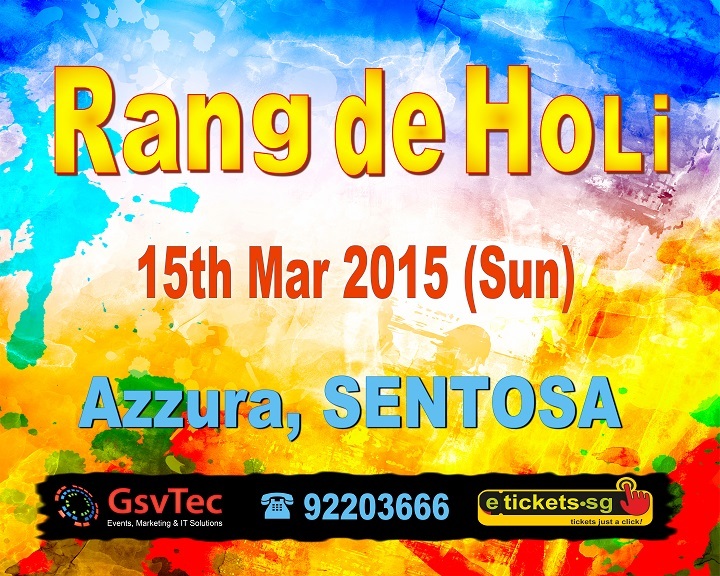 • Dry COLOR POWDER is not allowed in Sentosa in 2015 Holi Celebrations,we will have moist/wet color & water guns / Pichkari for the celebration of holi. • Only 300 lockers are available for rental at venue fr first come first serve.Pls come with least Baggage. • DSLR Not allowed as we will have event photographers who will upload them all post event for free. • Admission is subject to tickets produced at the entrance. • Children 4 to 12 years must purchase CHILD ticket for admission. • Children Above 12 Yrs Need to Purchase Adult Ticket for admission. • Tickets Once Sold are non refundable and non negotiable. • Organiser can change the event date , venue . • All Participants take complete responsibility of them self and their dependants .Organisers do not take responsibility for any claims for any incident caused directly or indirectly during the event. • All care has been taken to play with Natural Eco friendly colours,known to suit all skin conditions .Its advisable to do a skin test before you use the colours. • Organiser reserves the right to refuse admission to any person whose conduct is inaapropriate and poses a threat to security of the event. • Organiser reserves the right to change the venue, cancel or postpone the event due to unforeseen circumstances if required. • Ticket Holder voluntarily assumes all risk & danger incidental to the Event whether occurring prior to, during or subsequent to the actual Event, including any death, personal injury, loss, damage or liability. Organizer does not take responsibility for any claims. • Organisers are not responsible for any kind of direct or indirect claims on account of the event .As a event participant you undertake any such risk of any unforeseen incident that may happen during the event. You are responsible for your family and yourself. • Expected to be a Full house event,Entry Queue can be 20-30 mins,Limited Lockers, Pls be light n easy. GsvTec ,is run by a group of young innovative team,our core services include Events Management, Marketing & techno-commercial solutions.